One of my favorite traditions at our house started when our oldest daughter celebrated her first Christmas. She was ten months old at the time and Joe picked her up so she could set the angel on the top of the tree. Ever since then, the youngest member of our family gets the privilege, with Daddy’s help–although now he’s graduated to the esteemed and honorable title of Grampy. 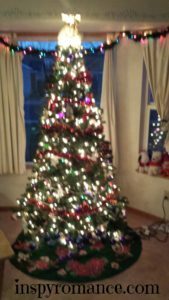 This year topping the tree went to our five-year-old grandson “Boo.” It was an especially heartwarming moment, because with much safety and care, Grampy took his usual place, helping him reach for the top. You see, Joe had a double stroke a couple of months ago. That he is still with us is a huge blessing, and that he was able to stand and help Boo–well, lets just say I got all choked up. We have so very much to celebrate as we enter the Advent and Christmas seasons. In my latest book, Mistletoe Daddy, there’s a scene where the youngest member of a group tops the Christmas tree with the angel–only there’s an adorable twist. I hope you’ll read it and find out for yourself. Do you have any favorite traditions in your family? I’d love to hear about them in the comments below! Wishing you and yours a very Merry Christmas, from my family to yours. Thank you for sharing this beautiful memory, Deb. One of my favorite holiday traditions is breaking out the old photo albums and remembering those who are no longer with us. We also have a few laughs over the hairstyles and clothes. Praying for Joe, your daughter and the entire family. Oh, those old photos! Our kids will someday join us in saying “What were we thinking!” when looking at styles in their old photos. Joining you in prayer for the Kastner family. I made a very simple stuffed nativity when my kids were little that they played with while we read the Christmas story. So fun to see them acting it out! My parents always make a big deal for setting up the nativity set. I really enjoy it. We each have to select a piece and talk about something (sometimes it’s why we’re thankful that year, how we’re seeing God in our lives, etc) before choosing a place for it under the three. I really enjoy these moments (also, because there’s no right place for a figurine under the three so we all get to be creative and account for the other pieces that also need to go, we’re not supposed to move someone else’s to fit ours–so we get an unique setting every year). I love that! I’ve always just “put up the nativity” along with other decorating. I love how you’ve made it such a special part of the family celebration. Hi Deb! You, your daughter, and husband are in my prayers during these trying times. May the Great Physician heal your family and give you strength to care for them and do your writing. Please take time for yourself. I know that is difficult at this time of year, especially with the added responsibility of caring for loved ones. I have been in your shoes. I enjoy this time of year. We begin with the advent wreath and calendar, then put up the tree around December 6 Sankt Nikolaus Day, and have a family celebration a few days before Christmas. With grown sons who have their own families, I try to do something fun and different each year. This year we are making gingerbread houses. Joining you in prayer for Deb’s family. Happy for you, that your husband was able to do that! My husband had a stroke five years ago , four days before we were to move our youngest daughter to college. He couldn’t walk or talk well. Our son flew up to help us move his sister to college. God has completely healed my husband now. Praying God continues His healing work in your husband. Praying with you, Diana. So glad to hear of your husband’s complete healing. That’s a fun tradition! I’m enjoying reading all these. I'm loving reading everyone's replies. I adore Christmas, my husband hates all the fuss! 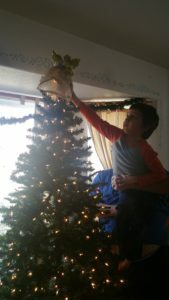 So on Christmas Eve, I go cut some evergreen branches, decorate them with clear lights, and that's our tree. We exchange our personal gifts that evening, while listening to carols. We also always have two Christmas dinners, one for just the two of us on Christmas Eve, the other the following day with his widowed mom! My family are a long way away in Australia, so we usually phone them late on Christmas Eve to catch them before they go to the Christmas barbecued roast lunch my brother does! Deb, so happy that Joe was able to help Boo carry on the tradition! What a wonderful tradition and I rejoice with you that Joe was able to do it! Our major tradition is doing all the decorations the day after Thanksgiving. And advent calendars. Mmmm sounds like a perfect evening!